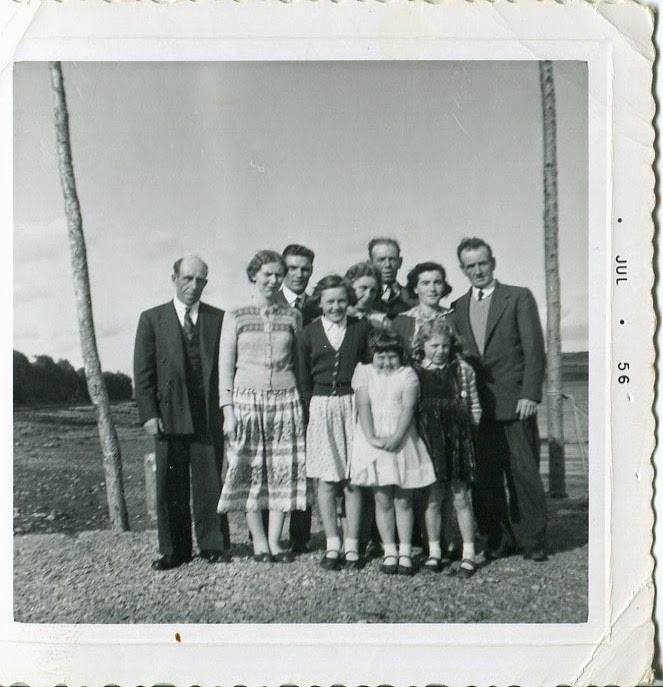 Today our guest blog is provided by David Carroll who as a child lived in Dunmore East with his parents; Harbour Master, Captain Desmond Carroll and his Mother Freda. David has written a memoir of his time there, and has kindly entrusted it to me from which I have taken an excerpt. The piece I have selected specifically deals with his experience of Dunmore Harbour and the comings and goings around the Harbour Masters home. 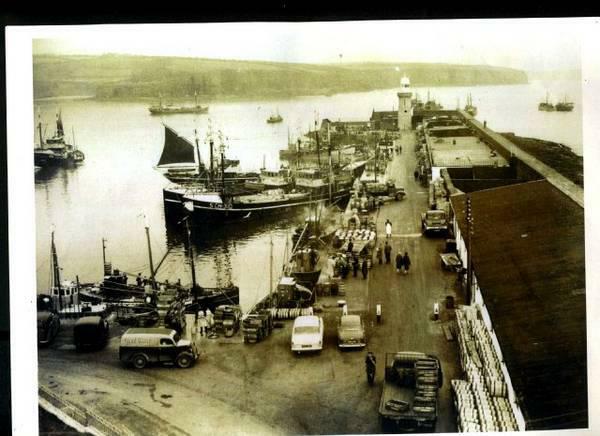 My Father was appointed harbour master of Dunmore East in autumn of 1947, a post he served until he passed away in 1969. 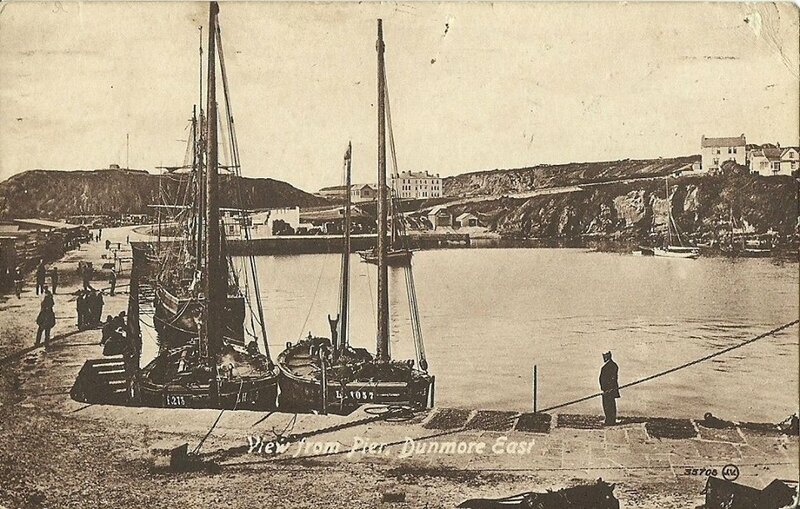 Being appointed harbour master at Dunmore East meant taking up the residence provided at Harbour Lodge beside the pier. Dunmore East is located on the County Waterford coastline where the estuary of Waterford harbour forms. 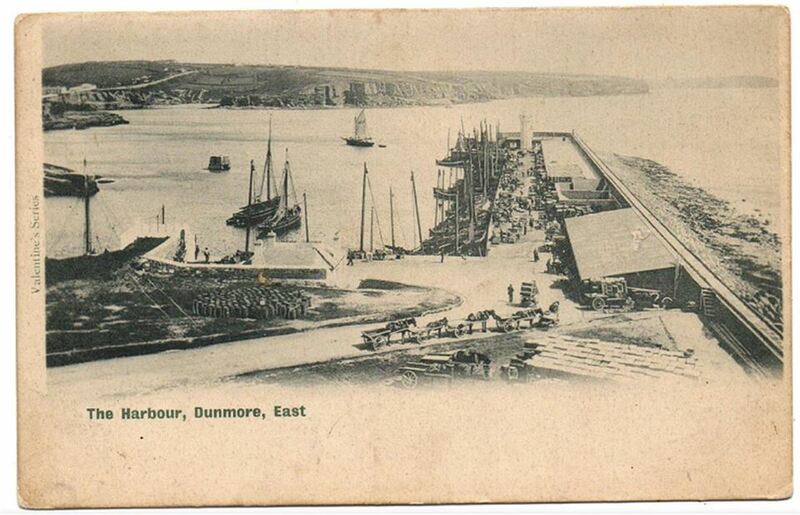 People living in Dunmore East tended to drop the ‘East’ part and refer to the village simply as Dunmore. The village itself then divided into two parts: ‘The Dock’ where the harbour and pier were located and then ‘Lower Dunmore’ on the way to the Catholic Church at Killea. A beautiful park, running down to the cliffs separated the two areas. On the opposite side of the park was St. Andrew’s Church of Ireland and a number of large houses including the Haven Hotel, which had originally been called Villa Marina, when it was the home of the Malcomson family. Stretching entirely around Dunmore as a backdrop were the woods which give the entire village a beautiful panoramic view, particularly from the sea. The wood and park had been left in trust to the people of Dunmore for their enjoyment. Reaching Dunmore by sea had the advantage of seeing all the beautiful small coves and beaches stretching around the bay, many of them with colonies of noisy sea birds called kittiwakes. For different reasons, these all became favourite places of mine and I retain fond memories of all of them. Our house was a particularly cold one. It was partly a one story cottage dating probably from the time in 1814 when Alexander Nimmo, a famous Scottish engineer commenced work on the new harbour at Dunmore to accommodate the packet station for ships, which carried the Royal Mail between England and Ireland. Records tell us that the work consisted mainly of a massive pier or quay with an elegant lighthouse at the end. Nimmo’s original estimate had been £20,000 but at the time of his death in 1832 £93,000 had been spent and the final cost was £108,000. By then (1837)* the harbour had started to silt up, and the arrival of steam meant that the winding river could be negotiated easily, so the packet station was transferred to Waterford. Some additional bedrooms were joined on later at the end of the corridor. Photographs taken around the turn of 20th century show only the old part. It was a very damp house as a result of being so old. In winter my parents overcame this and kept the house as cosy as possible by keeping coal fires lighting all day and having plenty of paraffin heaters in the hallways and bedrooms, which we always called The Aladdin, a trade name for this type of heater. They could be a bit smelly and difficult to maintain but were pretty effective nevertheless. Our house was at the start of the pier and from my bedroom I could see the lighthouse at the end and all the boats in the harbour and right out across the bay where you could see Lawveesh Rock, a headland with the local red rock and Councillor’s Strand and if looked to the left you could see ‘The Island’ which formed part of the harbour and where kittiwakes lived on the cliffs during summer months. It really was a wonderful view and you could spend hours simply looking out the window. No two days were the same, there was always a new boat sailing into the harbour or departing or moving her berth. My father’s predecessor had been called Major Wilfred Lloyd and he had retired after a long time in the position. He had a son called Llewellyn who I suspected slept in my bedroom a long time previously. A compass had been carved into part of the wooden window frame and we always credited Llewellyn with this. From a very early age I therefore knew where North, South East and West were located and knew if the wind was blowing from the north, it was coming from the direction of Councillor’s Strand and this was the one that was feared as the harbour was unsheltered from this direction. A south easterly wind or breeze came across from the Hook Head lighthouse located at the other side of the Waterford harbour estuary at the end of the long Hook peninsula. The pier gave shelter to the boats from this direction. Winds, tides, weather forecasts and conditions would form an integral daily part of our lives over the coming years. 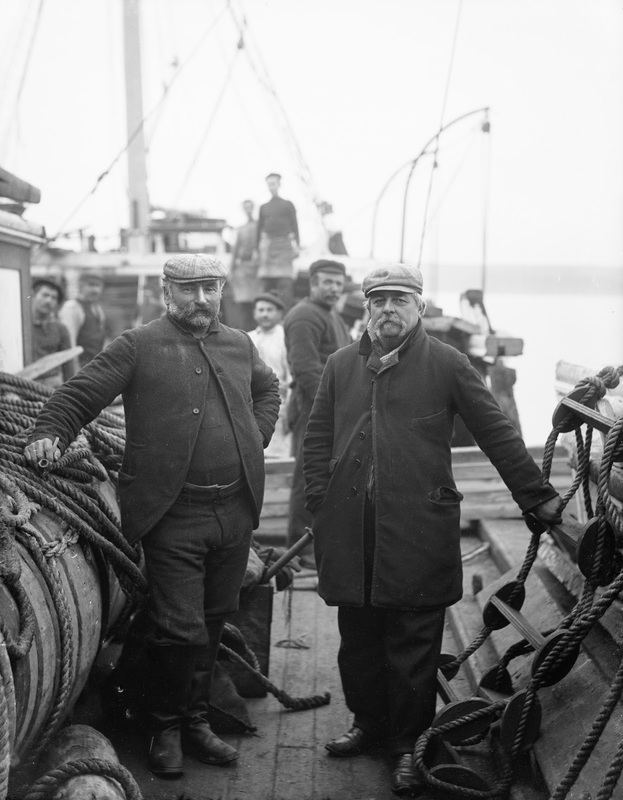 There were two distinct users of the harbour and pier and all the facilities provided and these were the fishermen, who made their livelihood and provided for their families by fishing and then there was another diverse group who used the harbour for pleasure in rowing boats, sailing dinghies, yachts and motor boats. In addition visiting yachts came to Dunmore East every summer and this was a big feature in our daily lives. Occasionally there may have been a bit of tension between the two groups. In fact there was a lot more that united than divided them as all shared a great love for Dunmore and its beautiful harbour and of the sea and had the deepest respect for the sea and its power. Everyone was in agreement that the sea was a powerful force and could take your life away whenever it wanted. This was a theme that my parents kept coming back to time again while I was growing up. If I was asked briefly as to what my father’s core role or job description was, it could be best summed up by saying that his job was to ensure that all users of the harbour was properly looked after. It was important that the fishermen had landing facilities and space to store ropes and nets and mend their nets and lobster pots. The people using the harbour for pleasure required simple access and safe and secure moorings for their boats. By and large, my father, using lifelong maritime skills and knowledge achieved that and was well respected and liked by everyone. The fishermen used the facilities throughout the full year but all sailing and boating came to an end in September. Summer and winter were quite different and even in spring and autumn there was always something new or different happening around the harbour. There was never a dull day! In addition, my father had other duties, such as record keeping and submitting weekly and monthly data to the Office of Public Work (O.P.W.) in St. Stephen’s Green in Dublin, who were his employers. The O.P.W. was always referred to by everyone in Dunmore as the Board of Works. The O.P.W. had responsibility also for the harbours at Howth and Dun Laoighaire in addition to Dunmore East. Along with Donaghadee in Co. Down, these four harbours had been designated royal harbours and since partition the O.P.W. had administered the harbours in the South. 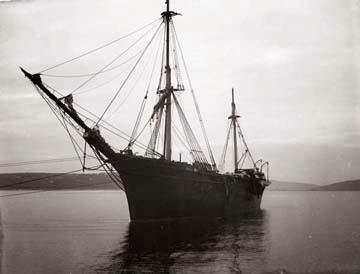 Other ports and harbours around Ireland were administered by harbour commissioners or local authorities. As soon as I could walk, I would accompany my father up and down the pier each day. Close to our house was a set of steps leading to the top of the pier wall at its starting point near Shannoon, a small clifftop mountain where the Pilot Station stood. On several occasions each day, my father would take his telescope and we would look out across Waterford Harbour mouth towards Hook Head lighthouse, three miles over on the Wexford coast at the end of the Hook Peninsula. Sometimes you could see a strange boat making its way towards the sanctuary of Dunmore. You had to guess where it might have come from and for what reason? 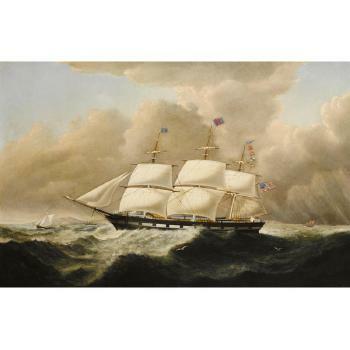 All ships leaving Waterford Harbour or destined for Waterford or New Ross located on the River Barrow would be picked out by father with his telescope and he could identify many of them by various means such as the distinctive painting on their funnels. In the evenings, the Dunmore fishermen would be making for home. The number of seagulls and other birds that swarmed overhead and behind the boats always gave a good indication in advance of a successful and lucrative day’s fishing. No seabirds usually meant no fish! The porch entrance to our house was a very important part of harbour life. People would come seeking all sorts of information and advice from my father but mainly about the weather forecast. My father would listen each day to the ‘shipping forecast’ on the BBC radio service and would be able to pass this information on, which was vital to anyone putting out to sea. There was a chronometer, which is a ship’s clock, in the porch and this could be seen through the window. It was very accurate and was wound each day with a big brass key. The chronometer, which is still in my possession all these years later, was first used in a steamship called the Mary Monica, built in Port Glasgow in 1879 and belonging to my grandfather’s company J.J. Carroll, 38 City Quay, Dublin and was used to supply his coal business in Dublin from Ayr in Scotland. I have an oil painting of that ship in my house showing her in a storm in the Bay of Biscay and a faded date on the painting looks like 1884. There was also a barometer which was constantly checked as this was an indicator of the predicted weather. When the barometer dropped, it was always a bad sign. All of this took place a long time before weather was forecast by satellite. There was also a clock with no mechanism but just two hands that my father set manually each day to indicate the time of ‘High Water’. The time of high water and low water was vital to every user of the harbour. There was a small inner harbour called the Dock Strand, which dried out at low water and this is where all boats moved to if the skipper wanted to clean seaweed from the bottom of the boat, paint or carry out any repair or take a fouled rope or net from a propeller, which was a common occurrence. (see first video below) Knowing the tide times and how many hours you had before the boat would be re-floated was of vital importance. Tides were also important for sailing craft leaving Dunmore East intending to sail up the Co. Wexford coast towards Arklow or Dun Laoghaire. As far as I can recall, the skipper needed to plan his voyage to be some-where around Tuskar Rock near Rosslare when the tide turned to derive maximum benefit from the tide and assist their passage. My father would have advised many a seafarer at Dunmore with this information. 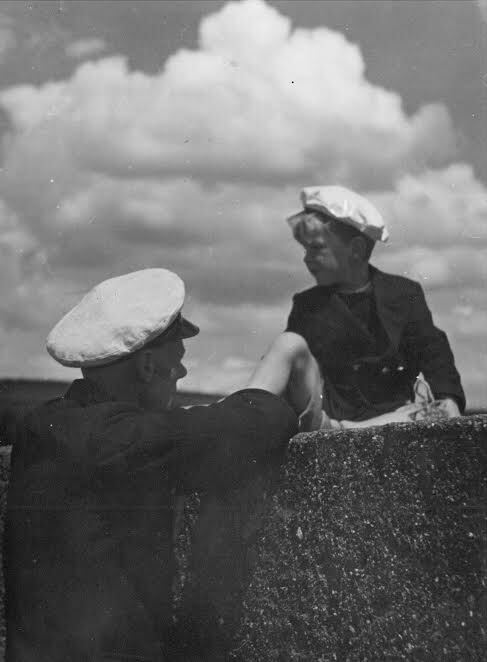 I perceived my father to be the most important person in the harbour and this gave me a certain cockiness at that time as I accompanied him about his business and I probably thought that I was his No.2. My mother told me much later that I used to say to people “My father is the Harbour Master and I am the Harbour Boy”. I did not seem lack any self-confidence in those early years! I really did believe in my own little mind that it was my harbour. 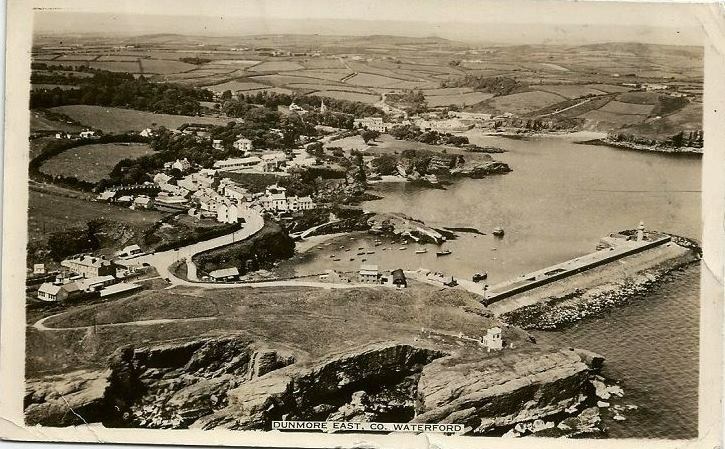 Who needed brothers and sisters when you had your own harbour instead? This is the second guest blog, and the first of 2017. If you would like to contribute a piece, please email me at russianside@gmail.com. The only criteria is that it needs to have a maritime connection to the harbour. I will format, source the photos if required and add in the hyperlinks. Guest blogs will be published on the last Friday of each month. Our next will be a piece on smuggling by James Doherty. Last Tuesday 17th I popped up a facebook post with my planning for 2017. 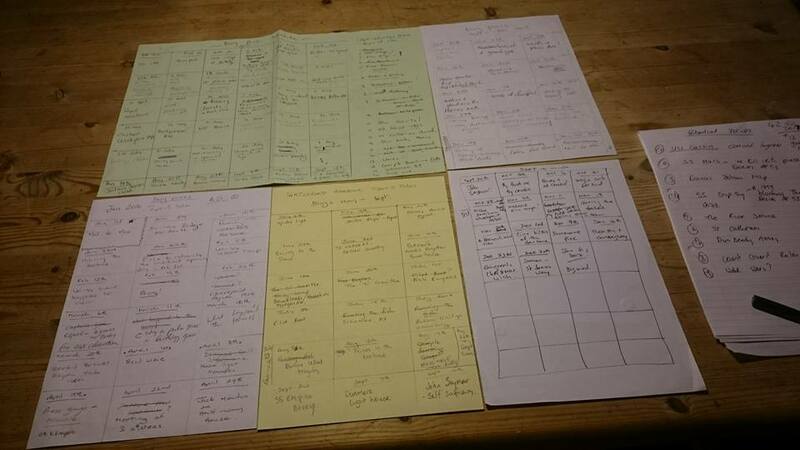 Well it was more an example of my planning for the two previous years. In this time I’ve managed to publish 152 stories about the life and times of my generation and those previous generations that make up Waterford harbour. It didn’t start out that way of course. I began as Rambling Thoughts on my Community, but that was two years earlier, as a means of thinking about what the closure of the Salmon driftnet fishery meant to a village that once depended on it. When I started doing walking tours, I thought what best way to remember all the historical facts and stories than writing them down. Last year I decided to rebrand. Waterford Harbour Tides’n’Tales was born and I’m very happy with it. Last year was significant in another way. I finished 2015 with 992 views or reads of my stories, but 2016 saw a significant increase in those looking at the blog weekly and we closed this year with 100,000. I’m hoping to double that in 2017. Readership figures are important to me. Not only because I want what I write to be read, but I want the heritage value and natural beauty of it to be recognised and hopefully to increase the number of visitors to the area. Some of whom may wish to take a guided walk. Some of the stories I have this year will be anniversaries that I think relevant. Some will be repeats such as the opening of the Barrow Railway bridge in July 1906. 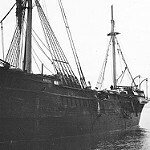 Some will be to remember significant events such as the loss of the SS Kinsale near Broomhill in November of 1872. I’m also constantly getting further information on previous posts which need to be updated such as the story of the loss of the Alfred D Snow. Others will be shocking but need to be told such as accounts of wreckers; an emotive term that needs to be explored and debunked. Others then are more significant; this year marks the 100 years since the loss of the SS Coningbeg and Formby. It will also mark the 100 year anniversary of the sinking of UC 44 at Dunmore East, my most popular blog to date. The Barony of Gaultier Historical Society plan to make this occasion in August this year. A new development this year will be the guest blog feature. On the last Friday of each month, I’m offering anyone with a story to tell about the harbour to submit a piece by email to me at russianside@gmail.com, The guidelines is that it should be about 1200 words and relate in some way to the harbour. That could be from Carrick or New Ross to the coast. I currently have three stories submitted two promised and two others being considered. I am very interested in getting stories from women, the women’s perspective on the hard life that was fishing and sea faring is as important as any other and deserves to be told. Each week I use Facebook to promote what I write. I’m ever mindful to thank people for those likes, comments tags or shares. The likes ensure that the individuals will continue to see my posts on their facebook page. The comments and tags increase the likelihood that their facebook friends will see the blog. Sharing it increases these chances even more. All are invaluable to me. I’m also ever conscious of the pages that share my blog. Michael and Tommy of the Waterford History Group have long supported my work, as has Michael Farrell of the Barony of Gaultier Historical Society and Paul and Jean at Waterford in Your Pocket. There are many more I should thank I have no doubt but for consistency these certainly deserve my thanks. For 2017 I am taking my courage in my hands and I am actively promoting my stories each Friday to pages local, national and international that might find my stories relevant. Its an odd feeling, to go out and promote your own work, I find it embarrassing and, since I mostly get no feedback or rejections, judgemental. Finally this year I intend to finally publish that book I’ve been talking about. I have 150,000 words about growing up in Cheekpoint and what it was like to live in a traditional fishing community. I’ve provisionally titled it “An inconvenient calling” reflecting to my mind the political indifference if not to say hostility to the fishing communities that ring the country. I hope to self publish this during the summer and I’m currently working to tidy up and edit the first draft. Thanks for staying with me if you have read this far, thanks for staying with the blog each week, and here’s to more readers and more visitors in 2017. Today sees the inauguration of a new president in America. It promises to be an “interesting” presidency with many fears as to the direction America is taking. One concern is the attitude to emigrants. So today I thought what better way to reflect on the event than my own Grandmothers family experience of emigration to America in the early 20th century. My Grandmother “Nanny” was born in 1919. She was the youngest of seven and had six brothers. Ritchie (Richard) Moran was the eldest and the other lads were Mikey, Christy, Paddy, Johnny and Willie. They were born in the Russianside, Cheekpoint, Co Waterford, Ireland in a small three roomed house. It was a fisherman’s cottage, close to the river, where as soon as the boys could pull an oar or haul a net they would have been out fishing. I’ve blogged before about the realities of fishing for us youngsters, but my grandmothers generation had it all together tougher; fishing was a poor livelihood with no welfare protection net, political and economic uncertainty gripped the newly formed Irish state, and the only safety valve for families was emigration. Nanny was never sure how the money was raised to send Ritchie to America but she suspected that some of her uncles on the Moran side, who were sailors, were already living in New York and that they organised the fare and a job. * Her only involvement was in the preparations for the the night of the American Wake which took place in the mid 1920’s. Her parents didn’t seem to have gone to bed and her mother looked drained and tired. Soon she heard a pony and trap come down the road. It was driven by a relation from Faithlegg named Burke. Into the trap went Ritchies case and after he said his goodbyes he hopped aboard and went off up the Russianside road, his brothers strolling beside the trap until it reached the top of the hill. Her father turned away and walked towards the shore and her mother turned towards the house and she remembered her wailing behind the bedroom door. It transpired that having travelled to Waterford to catch the train from Waterford’s south station to Cork and ultimately Cobh, (the route is now the soon to be fully opened Waterford Greenway) the station master had turned him back as they had received a telegram to say the ship was delayed. He took Ritchie’s case for safe keeping, told him to come back tomorrow, as there was no point sleeping in the station, or the docks in Cobh overnight. ** Ritchie’s trap had left, so he turned on his heels and walked the nine miles home. The next morning when she awoke, Ritchie was gone again but this time she wouldn’t see him for over thirty years. Ritchie eventually married a Polish lady and settled down in Westbury, Long Island. In time two other brothers emigrated to join him. And not only his own family, but others from the village went via his new home on Long Island too. Packages and other assistance was sent back and there were bundles of air mail labeled letters kept in the glass cabinet of the living room in the Russianside. The framed portrait of JF Kennedy needless to say adorned the wall. Ritchie and Peg had a family of three boys and a girl and his grandchildren and their children are now American through and through. Ritchie eventually died in America as did another brother Johnny. Willie who spent half his life in New York, retired home to the Russianside only to die not long after. Although my Grandmother was always sad to think of their loss to Ireland, I’m aware of how much opportunity the journey afforded them. Today in America a new President will be sworn in, and you can’t help but wonder how it will impact on actual or would be emigrants and their opportunities. It appears that President Trump and his team, themselves the product of emigrants, have lost touch with the origins of their United States. The Moran brothers sought a new chance not to sponge on their adopted land but to enrich it. Their motivation was to escape financial and economic hardships for an opportunity to continue to work hard and put money in their pockets. The vast majority of emigrants then and now simply want nothing more. When my Grandmother experienced the American wake in her childhood it was to acknowledge a loss, but also to celebrate the opportunities. Afterall, the entire family had a stake in the emigration of their eldest sibling. You can’t help but think that today in America the stakes are no less important, but on a national scale. As a nation, the Irish have an obsession with weather. But in a fishing community (and to every farmer) the weather is an event planning consideration. From our earliest years, silence was expected when the weather came on the telly or the radio at home. 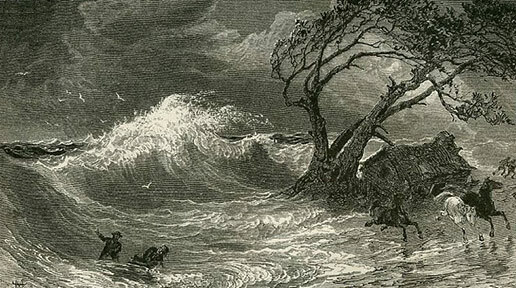 When salmon fishing, easterly wind was considered a “black wind” and men would sometimes stay ashore rather than waste time and fuel when they knew the salmon wouldn’t swim. In Cheekpoint northerly wind would mean no shelter at the main quay, and depending on the tides being fished, boats may have to shift round to the Russianside and Ryans shore. The scene was repeated in reverse for southerly winds. My father was less interested in the look of the weather forecaster than in the cyclones and anticyclones as depicted on the charts and we knew when we heard talk of the barometric pressure falling rapidly that we would need to find shelter. (Mind you when the weather is settled Joan Blackburns outfits often gets remarked) I’ve mentioned before how the skippers would drive up to Coolbunnia to look down the harbour to see how the waves were looking at Broom Hill, before setting sail for herring. One of the skills I never mastered was the skill of looking at the sky to determine the weather. I can remember the likes of Paddy or Christy Doherty looking at a cloud formation or a sunset and telling you what the weather would be like when you woke up the following morning, or indeed within an hour. The event began the day before, when a blanket of snow fell across the country. On the 6th an approaching Atlantic storm mixing warm air with cold air led to a dramatic drop in temperature and rapid increase in wind. All this was been played out off the west coast while inland a stillness had fallen. The snows had melted during the day, yet there was no sun, only a low overhanging cloud and a very unseasonal heat. As people were busy with the preparing for Little Christmas, they probably didn’t spend a lot of time thinking on the conditions. By about 8pm on the evening of the 6th the storm that had been building broke and rapidly increased by the hour. By midnight it had reached its peak and at that stage rain was breaking windows in homes being driven horizontally by hurricane force winds. The wind blew from a south west to north west direction during the night and at its peak reached 100 knots or 185km/h. The barometric pressure was estimated at 918 hecto pascals. It would be the early morning before it finally blew out across the Irish sea. My Father hadn’t any specific details for damage locally, and indeed the Waterford Mail of the 9th Jan that week confirmed this. Apart from the damage reported nationally, which seemed to be in a band across the north of the country but reached as far south as Carlow, locally we had tremendous winds but little rain, fallen trees were reported and some roofs stripped. 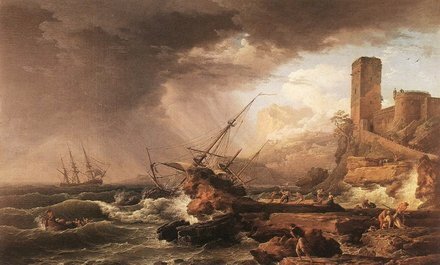 Ships rode out the storm at the quay with no issues, although road connections were problematic and the mail packets were delayed by two days. The nearest deaths were reported at Carrick on Suir. My Father said that what bothered the old people was that they never read the signs of what was to come, and he used to say that they believed the fairy folk had toyed with the weather.